"My Daughter walked in the front door of Golden Sierra angry. She came out as a person who identified that she was a Gift, and she could change her life by making better choices. It worked. She is now focused, happy, and looking toward her future." All I can say is WOW. - John T. C.
"I was so worried about our daughter. She was starting to experiment with drugs and alcohol and hanging out with dangerous people. Fortunately, it was not too late. Since attending the class, she is a new and different person. She is now on track and will graduate with her class." - Carol F.
"As a single mother, raising a son is a challenge. He started spending time with a rough crowd and was thinking about joining a gang. I was afraid for my son. The KIND Program helped him to see that there is no future in being a gang member. The program has helped him to see that going to school and being responsible will help him achieve an unlimited future. Thank You, Golden Sierra, Thank You." 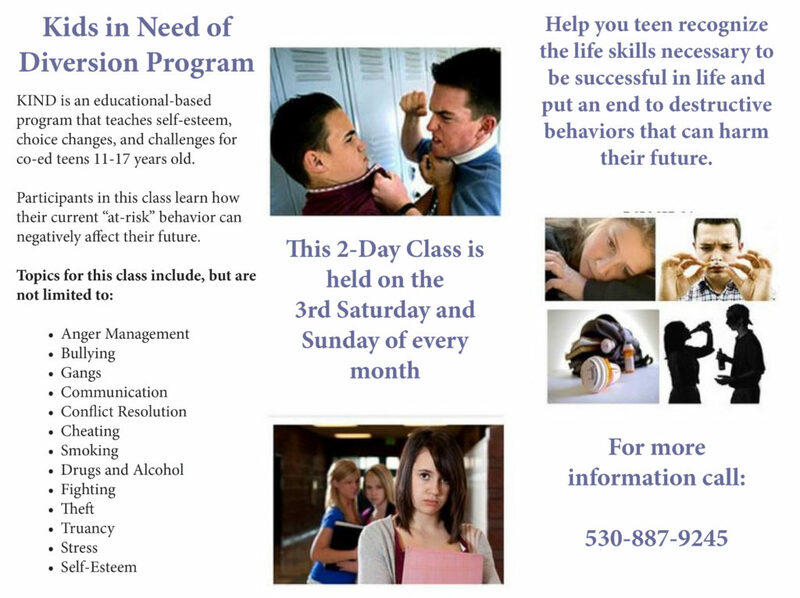 - Judy D.
For further information, or to register for this class, call us at 530-887-9245.